The 5125ML tractor is ideal for operators that regularly work on tree fruit and nut growing acreage. 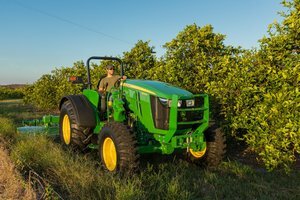 John Deere is now introducing the new 5090EL and 5125ML tractors, expanding its lineup of specialty tractors. In addition, the company will be making upgrades to the 5100ML and 5115ML low-profile tractors. The new 5090EL tractor has a low stance and it is built on the John Deere 5E 4-cylinder platform. Because it has a height of only 69 inches, it can easily fit through doorways and other small areas. However, it still packs a punch with 90 engine horsepower. The new 5125ML is equipped with John Deere’s PowrQuad Transmission, which was previously only available on larger tractors. Gear changes can be made at the push of a button and no clutching is required. For more information on the new 5090EL, 5125ML or upgrades to the existing low-profile tractors, contact your local John Deere dealer or visit www.JohnDeere.com.